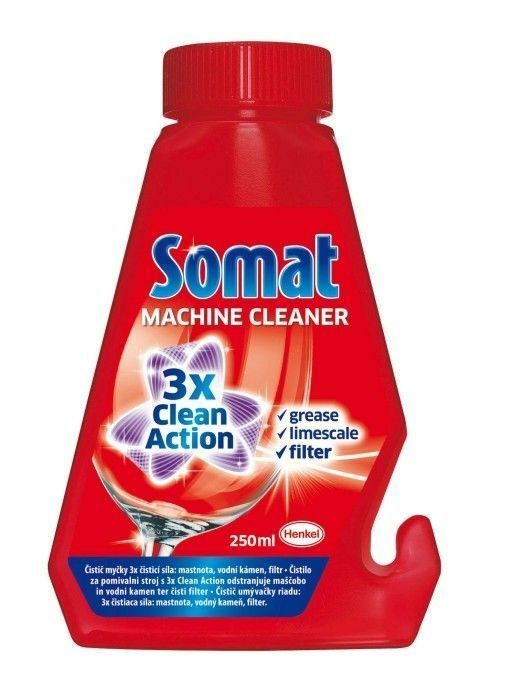 Somat Cleaner Cleaner 3x Cleansing Force - Removes grease and water in the dishwasher, spray nozzles and filter. Fully empty the dishwasher. Remove the foil from the closure, the white point under the foil must remain intact. Put the bottle in the cutlery basket down or hang it on the top of the dish. Use program 65 ° C-75 ° C.
Recommendation: Use Somat cleaner once every 1-2 months. Warning. Causes serious eye irritation. Irritating to skin. If medical assistance is required, keep the packaging or product label at your fingertips. Keep out of the reach of children. Wear protective goggles. In case of eye contact: Rinse cautiously with water for several minutes. If eye irritation persists: Get medical advice / treatment. After skin contact: Wash with plenty of water.